Everyone is talking about the Supreme Court’s ruling on Obamacare. But I don’t want to talk about that now. I want to address another controversial 5-4 ruling, one that many said was the last one before this to garner such attention. James Fallows alluded to it in his hyperbolic-yet-interesting-but-ultimately-irrelevant pre-ruling post: the curious case of Bush v. Gore. Since I didn’t start blogging until nine years after that decision, I’ve never really talked about it on here. It’s quite interesting. What does our go-to source, Wikipedia, tell us? The Court held that the Equal Protection Clause guarantees to individuals that their ballots cannot be devalued by “later arbitrary and disparate treatment”. Even if the recount was fair in theory, it was unfair in practice. The record, as weighed by the Florida Supreme Court, suggested that different standards were seemingly applied to the recount from ballot to ballot, precinct to precinct, and county to county, even when identical types of ballots and machines were used. I have read this over and over. I am no legal expert, but I can read English. I am going to write, in a separate paragraph, in bold, my reading of this. If you are a legal expert, please explain to me if I am making mistake in the following paragraph, for I can see no other interpretation. The Court had to make sure their ruling applied only in that case, because otherwise it could conceivably call into question many other elections in the history of the United States, and future ones as well. Certainly, every recount was now suspect. According to their findings, known methods of vote counting may have been unconstitutional. I mean, if they couldn’t recount votes in a constitutional manner, how could anyone be sure they had counted them right in the first place? I am not saying the Court was wrong. I am only saying that if they were right, there existed a possibility that the entire system was fundamentally flawed. At least that’s how I read it. Am I wrong? However, this part was a 7-2 ruling. The 5-4 ruling was the controversial one, the one that said they couldn’t try a constitutional recount. A close examination of the ballots found that Mr. Bush would have retained a slender margin over Mr. Gore if the Florida court’s order to recount more than 43,000 ballots had not been reversed by the United States Supreme Court. But[…] Mr. Gore might have won if the courts had ordered a full statewide recount of all the rejected ballots. I think it’s clear what the dominant strategies are in this case for any political partisan, no? But the Supreme Court is not political! They are just a machine that ruthlessly interprets the law, not biased in any way, shape or form, right? They wouldn’t decide an election based on anything other than legal precedent. That wouldn’t be logical. What would Vulcan High Command say? There you have it. They had to do it! Everyone was laughing at us! AMERICAblog notes that a recent poll found that not only is Mitt Romney less popular than Obama, he is also less popular than George W. Bush. This is what I mean when I talk about charisma. I mean, I like Bush better than Romney. I don’t know why. Bush seems like a more easy-going guy, I guess. There’s no logical reason for it; I’ve never met either of them. And say what you want about Romney, but he does not have a proven track record anything like Bush’s. Romney didn’t preside over the beginning of one of the worst recessions in history. Romney didn’t declare major combat operations had ended in a highly controversial military operation that would continue for another eight and a half years. It’s totally irrational. Seriously, Bush became a two-term President almost entirely because of his mysterious ability to seem more likeable than other guys. Paul Krugman is excited that the press is calling Romney out for cherry-picking data. Krugman also believes they are treating Romney with a more critical eye than they did George W. Bush. And he’s right. 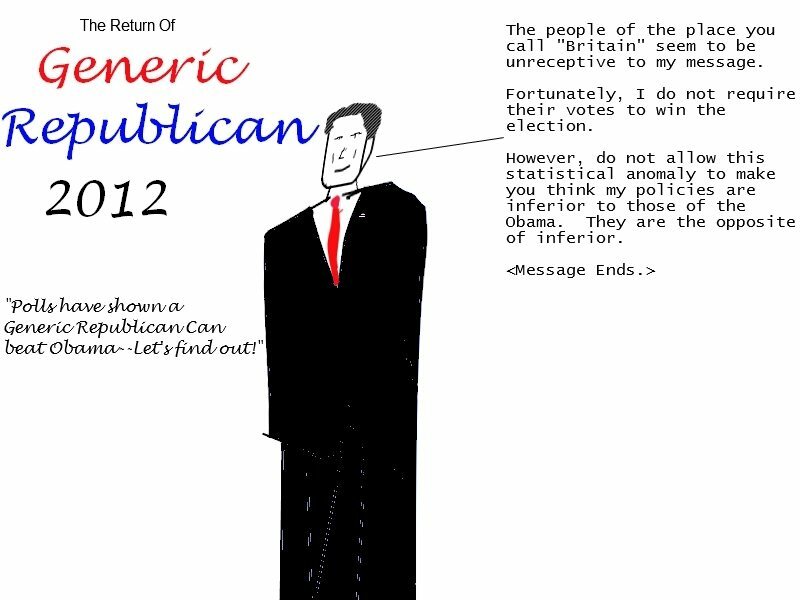 But, I suspect the reason for this is a rather depressing one: Romney is less charismatic than Bush was. This, rather than any new-found commitment to truth on the part of the national press, is what has caused this. Both Romney and Bush are rich sons of politicians, but Bush could more credibly pull off the “I’m just like the average Joe” act. Whereas Romney just seems like an awkward rich guy when he tries that. In terms of both who they are and, what is more important, what they mean to do to the country, Bush and Romney are quite similar in my eyes. The differences are superficial, but superficial differences are, as it happens, quite important in Presidential campaigns these days. A new Gallup poll puts Ronald Reagan as the nation’s greatest President. Then it’s Lincoln, Clinton, Kennedy, Washington and FDR. My opinion: Lincoln, Washington and FDR are the only ones out of that crowd who could conceivably have any claim to the title of “greatest President”. And where is Eisenhower? I mean, maybe he wasn’t the greatest President ever, but he ought to have been in the running. Also, George H. W. Bush should have gotten more votes than George W. Bush, in my opinion. Finally, I think President Obama shouldn’t even be eligible for this poll yet, since he’s currently President and we have yet to see what he’ll do the rest of his term and if he’ll win re-election. Andrew Sullivan is “trying to understand the Tea Party.” It’s interesting, though he doesn’t seem to have reached my conclusion, at least not yet. One huge mistake people make is to act like Obama is the first guy in U.S. history to ever advocate redistributing wealth for what he thinks is “the greater good”. He’s not close to it. Theodore Roosevelt was a progressive corporate regulator type. FDR implemented Social Security. Lyndon Johnson had his Socialist “Great Society”, a term which ought to give any individualist a fright. controls in the United States? Republican President Richard M. Nixon. That sounds like something Michael Moore would say. And it’s incorrect. I think he must be thinking of George W. Bush. But it leads nicely into my point about how Republican economic Socialism works. When Republicans redistribute the wealth for the “Greater Good”, it generally involves giving it to either corporations or particular kinds of Churches, rather than other entities–individuals, non-profits, etc. They are particularly fond of paying money to corporations that make weapons, or, in one infamous instance, secret mercenary corporations. Some may debate whether this practice is technically Socialism or technically Fascism. In my view, Fascism is nothing more than a particularly militaristic brand of Socialism, so it makes little difference. The point is that both sides are redistributing wealth in order to serve society as a whole. “If we allow that Socialism (in the ethical, not the economic, sense) is that world-feeling which seeks to carry out its own views on behalf of all, then we are all without exception, willingly or no, wittingly or no, Socialists…. All world-improvers are Socialists.”–Oswald Spengler, The Decline of the West. To which I would add only that if you already have a Socialist “ethic”, and you become a powerful politician who can influence aspects of the economy, it is virtually impossible not to become an “economic” Socialist as well. What bothers me about the quote from Paul is that he’s poking around the edges of a very deep insight into the truth of how the American political parties really act, whatever they may claim they believe. But he has somehow gotten things completely backwards.